Joint Hull Committee has intro- duced a structural condition war- ranty that will require owners to carry out a survey of their vessels within a specified time before insur- ance cover can be renewed. Bills legalizing gambling on U.S. passenger vessels and giving ocean freight consolidators more flexibil- ity in fulfilling bonding requirements were recently sent by the House to the President's desk. Administration to scrap 116 obso- lete vessels in the national defense reserve cargo fleet under a five-year timetable. Maritime industry has pushed the provision as a way to increase the number of U.S. cruise vessels and make them competitive with their foreign-registered counterparts. The reserve fleet scrapping bill requires the scrapping of all of the vessels in the reserve fleet over the next five years—except the 96-ves- sel Ready Reserve Force that is kept in quick activation status for mili- tary supply operation status for mili- tary supply operations in the early stages of a war or emergency. Scrapping those vessels will save about $10 million in yearly mainte- nance costs, according to the GAO, and their sale for scrap could gener- ate $38 million to $42 million to improve the ready reserve fleet. To Oil Spill Group of risky commercial ships and on de- priving some of them of hull insur- ance. Coming in the wake of the worst year for casualties for bulk and com- bination carriers, this strategy is part of a plan to be phased in by members of the Institute of London Underwrit- ers (ILU) and Lloyd's of London, the institutions that comprise most of the worldwide marine insurance market. Representing both the institute and when an owner might be asked to con- duct the extra survey. 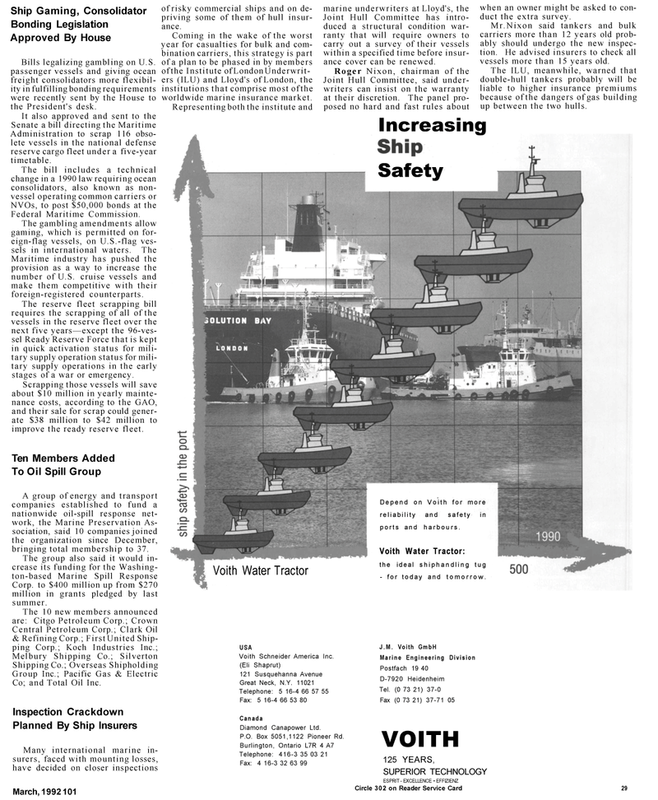 Mr.Nixon said tankers and bulk carriers more than 12 years old prob- ably should undergo the new inspec- tion. He advised insurers to check all vessels more than 15 years old. A group of energy and transport companies established to fund a nationwide oil-spill response net- work, the Marine Preservation As- sociation, said 10 companies joined the organization since December, bringing total membership to 37. Corp. to $400 million up from $270 million in grants pledged by last summer. Co; and Total Oil Inc.
P.O. Box 5051,1122 Pioneer Rd. Depend on Voith for more reliability and safety in ports and harbours. Voith Water Tractor: the ideal shiphandling tug - for today and tomorrow.